Our classified platforms make it easy for active seekers to find what they’re looking for. We offer comprehensive classified listings through our print and digital platforms for a variety of buy or sell products, services, and opportunities. All classified advertisements appear on AL.com and in newspaper classifieds (Birmingham News, Huntsville Times and Mobile Press-Register), expanding your total reach. 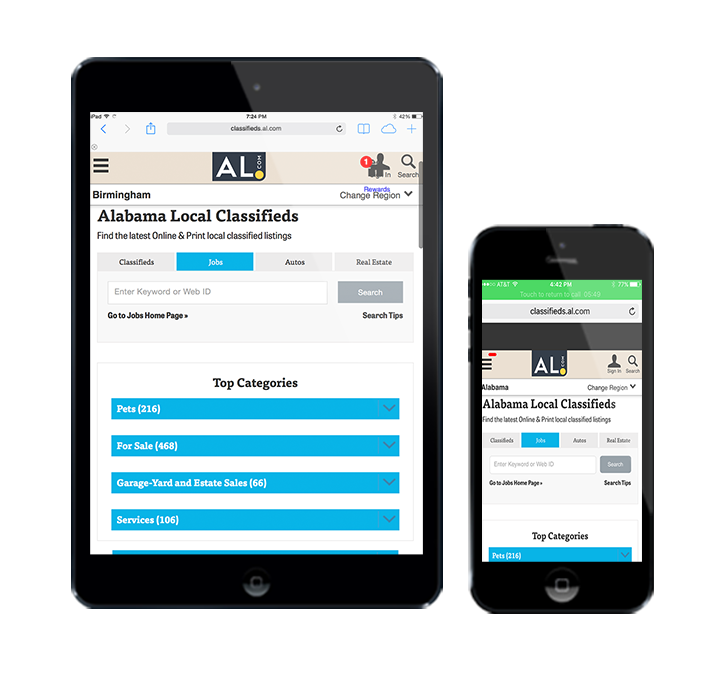 AL.com is the #1 most read news site in Alabama and newspaper classified advertising has a proven history of success serving as a consistent and reliable reader resource. For Businesses: place an ad in our extensive classifieds to reach shoppers, homebuyers, renters, auto intenders, active job seekers and more audience segments across the state. For Individuals: communicate or promote offerings and events to your community; garage/estate sales, autos, jobs, commercial property, homes for rent or sale, and other merchandise.